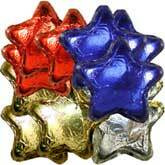 Creamy milk chocolate stars wrapped in foil. During the summer months (May - Sept.) , there is a $10.00 cold packing fee and overnight shipping that will have to be added to your order. You will be contacted and told how much it will be for the overnight and you can decide at that time if you still want to go through with the order. Great filler for any party favor! During warm months (usually May - Sept.) an additional $10.00 cold packing fee will apply, as well as overnight shipping fees. You will be contact and told what the extra overnight charge will be before we charge you.